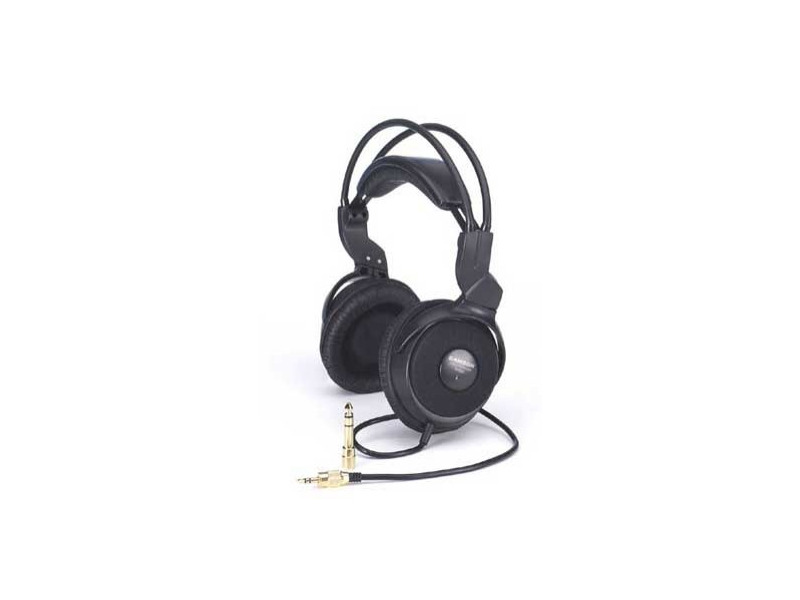 Reference Headphones Open Ear Design With 40mm Diaphragm, Top Of The Line Drivers and High Quality Neodymium Magnets. Includes Heavy Duty Cable With A Gold Mini Phone Plug and 1/4" Gold Adapter Included. Frequency Response From 20Hz To 22kHz. I bought the Samson RH 600 for studio monitor use.I wasn't aware of this brand , I discovered it in the shop. Please note, RH stands for Reference Headphones [as stated on its box],aimed mostly to studio recording use.I had the chance to listen to this headphones extensively ,using a variety of CD's [around 20]as a source.I also had various headphones available at that time, from many Well know brands ,in a price range of 50-220 euros ,including Sony & AKGs. ,Behringer ,and Senheiser.So I was really able to compare. The reason I decided to buy this headset was the listening of Alani's Morissette Ironic song,from CD.I compared the same points of the song, in an A-B comparison with an 185 euros headphone .The middle and the high frequencies are ,compared to this expensive rival, close enough.Excellent, detailed mid & hi frequencies, with only a very slight coloration.If you listen to the intro of Ironic with RH 600,you will know what I mean. The acoustic guitar at intro of it,is sound greatly with RH600.I also really enjoy the way that the voice of Alani's is reproduced. Of course ,you just cant expect a 44 Euro headphone to compare details with ,say ,the AKG's K240 , but this cost much more.Bass extend is also very well ,and controlled. The minus point of RH 600 is when it is used with complex material. While it shines ,with relatively small mixes ,meaning only a few instruments it sounds great.When the music material is more complicated in terms of orchestaration, its expensive rival ,due to my listening tests, it was clearly more clean,with a much better stereo separation.My comparison .was lasted more than 45 minutes,so enouigh material have been heard. At home the RH 600 proved to be satisfactory,both for music recording [that's what is designed for],and very enjoyable to use for listen a wide variety of music ,including classic.It just be more enjoyable with quartetts ,but its not bad at all with big symphonic works. Can I depend on it to mix a demo in my studio? I can't say I can.But .I will be definately will be able to use it for reliable monitoring of a guitar ,a drum set or a drum set. I acquired my Samson RH600 headphones as replacements for the relatively awful Samson SR850. Build: Light but pretty sturdy. The internal units are designed to touch against the ear, which is a little irritating and may take a little getting used to. They are semi-open circumaural, and therefore not good for studio tracking, but I've found them good for mixing. Comfort: 4/5. There is always room for improvement. They are not too tight and are self-adjusting. Quality: These are well balanced headphones. The bass is not too strong but highs and midrange are good. Before I acquired these I found a frequency response chart for them on a Japanese website, and noticed they had a very similar response curve to the highly rated Sony MDR-7506 and MDR-V6 that retail for more than double the price, although the sensitivity was lower. The quality out of the box was instantly impressive. I then burned them in with 10 hours of white noise followed by 8 hours of varied music, but there was barely any improvent. The sound is clear, highs are crisp and the soundstage is very good. With these I found I was able to hear details that were not obvious on my speakers or the inferior Samson SR850. The bass is tight and not overpowering, and they are capable of high volume levels.without distortion. These worked well with various genres of music including Mozart, Glenn Campbell, The Beach Boys, Hawkwind and Michael Jackson. I dare say, had I tried the Sony MDR-V6 (or something else even more expensive) I may have been more impressed with them, but for the price the Samson HR600 cost they are excellent value for a budget price.